The MACS session began with Dan Spurgeon of CAT who introduced the new Track-Type Tractor D6. Dan pointed out that the D6 is equipped with a completely new design HVAC system called Conditioner Group, which is mounted outside the cab. This Group is a combined heat and A/C system built as a compact, low profile box, with improved reliability, high performance, reduced service time and optimized to meet A/C, heating, defrosting and sound level targets. Condenser group, part of Conditioner Group, is easily removable (when required) as a single unit. Mr. Spurgeon explained that condenser fans are reversible and they, as well as the blower, are brushless. Speed of fans is adjustable based on ambient and heat load. Next, the speaker presented the 120 Motor Grader. Its Conditioner Group is also mounted outside on the back of the cab (in the previous version the system was located under seat). Benefits of this group are very similar to the D6 machine group. However, he noted that the motor grader’s air ducting system, which is very complicated, provides excellent air distribution to the cab. These two, as well as most other CAT HVAC systems, have common software, and typically for such control systems in different machines, are very similar. They can control everything: blower speed, fans, compressor, condenser fans, variety of sensors, etc. The second part of the CAT presentation was on selection of an alternate refrigerant for off-highway machines. Spurgeon pointed out that the Paris climate agreement (specifically for R-1234yf refrigerant) was adopted by EU and 120 other countries, including the U.S., Canada and Australia. He advised the audience that CAT completed the R-1234yf technical and manufacturing solution; system design is in process and the dealer network isn’t started yet. He concluded that new CAT R-1234yf machines will be available within the near future. Leo Chernyavsky of CNH covered cab pressurization and CNH machine service updates. Most of CNH equipment operates in a very dusty environment, indicating that very important issues are cab sealing, air filtration and cab pressurization. Leo pointed out that the operator’s comfort zone lies between 50pa and 200pa with fresh air about 43m3/hr. Pressurization requires appropriate cab sealing and fresh air delivery, as well as a pressure relief method and control method. He said that the cab leakage curve always must be between min/max acceptable cabin pressure. Some Chinese vehicles are being shipped to South America with a different type of refrigerant gas than what most technicians are used to seeing. In this case it’s a blend refrigerant called R-415B. Sightings of vehicles with this refrigerant were first reported to MACS early in 2017 by members in Montevideo, the capital and largest city of Uruguay, South America’s second smallest country. Marketed in Uruguay as the “Glory”, this 7-passenger, unibody MPV is manufactured by Dongfeng Xiaokang Automobile Co., Ltd., a subsidiary of DFM (Dongfeng Motor Corporation) in Wuhan, Hubei Province, China. Underhood vehicle information label shows it’s powered by the Chongqing Xiaokang 109-horsepower, 1.5-liter, 4-cylinder engine. R-415B is an HCFC (hydrochlorofluorocarbon) zeotropic blend refrigerant, consisting of 25% R-22 and 75% R-152a. It is a Class-II ODS (Ozone Depleting Substance) with an ODP (Ozone Depletion Potential) of 0.013, and as such is controlled under the Montreal Protocol. It also has a GWP (Global Warming Potential) of 550, meaning it’s 550 times “more of a global warming gas” than CO2 (Carbon Dioxide). So far we don’t know much about the system, and we haven’t been able to connect a refrigerant identifier to verify the refrigerant’s composition. We also don’t know about the exact type of compressor oil that they’re using, which is a big question among local technicians. They also want to know if any other vehicles or brands are using R-415B refrigerant, but to date we haven’t heard of any others. What type of hoses are being used? What is the oil type? How does it interact with the refrigerant? What material was used to make the seals? But we did find out that the service port connectors are the same type as those used for R-134a, and without the proper service equipment (and a supplier for the gas), it’s likely that R-134a will be used as a replacement when necessary. Technicians should use caution when servicing these systems however, as the R-152a component is flammable. Please contact MACS at info@macsw.org if you have any questions, or if you have any technical information about this system that you’d like to share with the Society. Thanks! Founded in 1981, MACS is the leading non-profit trade association for total vehicle climate and thermal management. 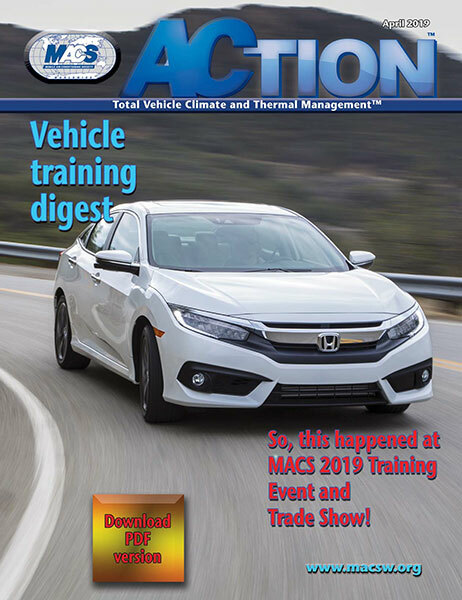 The Mobile Air Conditioning Society (MACS) Worldwide is pleased to sponsor the Automotive Software and Electronics Boot Camp with Dr. Mark Quarto Quarto in partnership with FutureTech Auto at the MACS training center in Lansdale, PA September 16-20, 2019. Top auto repair shops need to learn relevant new skills related to electronics, computer software writing, and coding to tackle today and tomorrow’s repair jobs. The automotive industry has transitioned most automotive systems into the space of advanced electrical, electronics, and software controls. Additionally, hybrid/electric propulsion and ADAS technologies are requiring technicians to become creative and skilled in non-mechanical aspects of the vehicle. Even modern HVAC systems have experienced advances in power electronics with the use of high voltage electric heating, air conditioning, and heat pump components. Know differences and specific functions of software, firmware, and hardware systems. Learn fundamental knowledge and skills to build microcontroller-based control applications and hardware interface tools that can be used for monitoring, analyzing and/or diagnosing most automotive systems. Learn how to use electronic devices such as diodes, transistors, op-amps, opto-isolators, voltage translators, logic ICs etc. to create diagnostic & testing tools with hands-on projects. 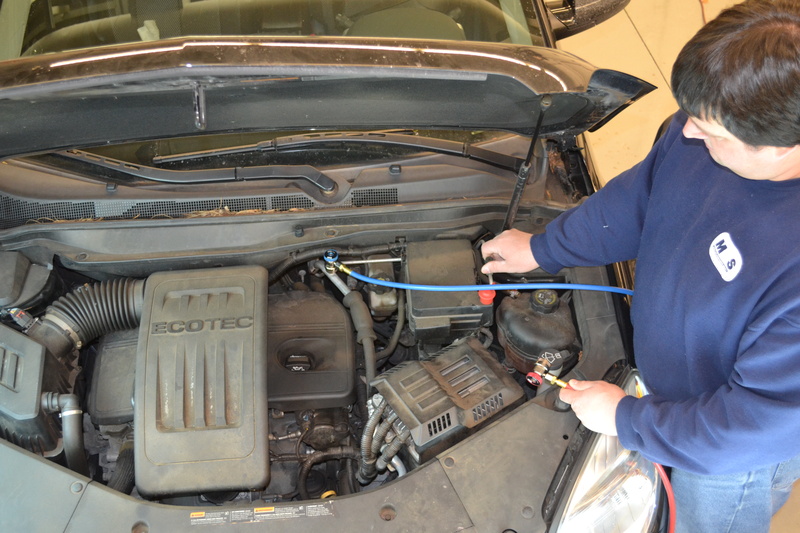 How electronic devices can be used to augment vehicle circuits and the scan tool for testing or diagnosing system faults. Create and build signal conditioning tools to interface vehicle systems with a microcontroller by using hands-on projects. How to write software programs to perform specific diagnostic and testing routines that can be used with/without a scan tool. How to code software programs to command a microcontroller to perform functions to monitor, control, or test circuits. Learn how to create microcontroller systems that can be built for use with a scan tool or on-board vehicle system to manipulate systems operation for the purposes of circuit analysis and diagnostics without the need for purchasing expensive test tools. 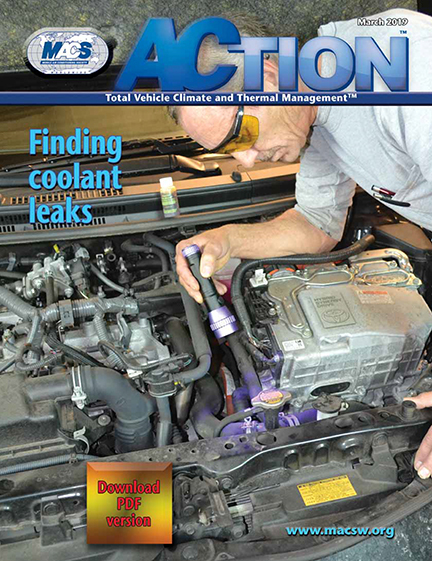 Some days, around this time of year, it feels like all we do is chase down coolant leaks. Maybe that has something to do with weather patterns and large swings in ambient temperature. It may also relate to how well customers take care of their vehicles, how often they take them in for service, or the replacement parts they use. Regardless of the reason, such repairs must be made, and finding out the cause needs to happen quickly and accurately. Read this article. Download the entire magazine. Everyone knows the Schrader valve; it’s been around since 1893, and has been used in A/C systems since we haven’t had to open the car windows to stay cool. But few people are aware of the technology and manufacturing complexity used to make these simple little valves. Meet MACS member, Jeff Schultz, the product engineer for Schrader A/C valves. Jeff is the senior product engineer at Schrader in Altavista, Virginia. Jeff, who has been at Schrader for 28-years, helped develop the family of Schrader A/C valves. Jeff is responsible for a variety of engineering improvements in the function and durability of these valves and enhancing their quality. The Schrader U.S. lineup of A/C valves is the broadest in the industry. Schrader produces every style of A/C valve used in the world. Each valve design is engineered, and is produced, for a specific application. These valves, almost 150 million of them a year, will continue to be made right here in the USA, in central Virginia. The production system is highly automated, and includes multiple automated quality checks, including a leak test of every valve to assure that all Schrader valves meet the most stringent original equipment (OE) quality standards. Jeff Schultz gives MACS Steve Schaeber a tour of Schrader’s plant. Recently, Jeff gave a plant tour to MACS manager of service training, Steve Schaeber. Steve witnessed the processes used to make the various cores. 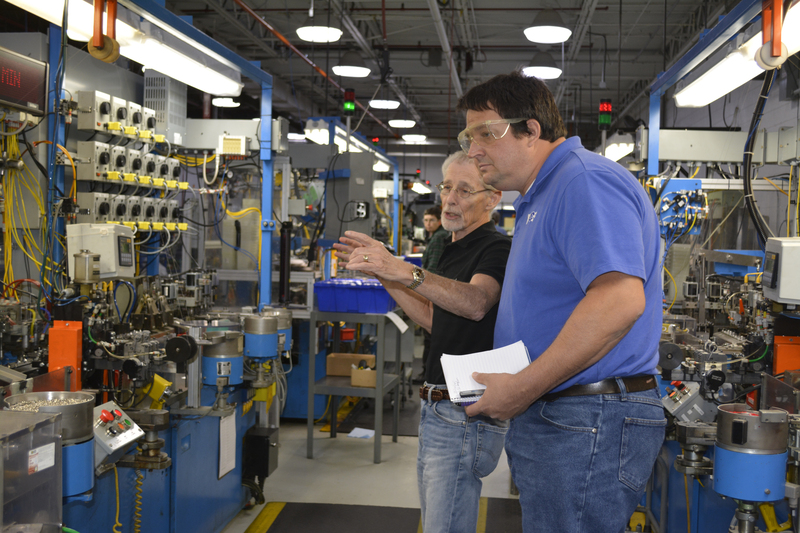 Jeff showed Steve how the valve components are machined, in specialized, high speed, precision machining centers, some producing as many as 22 million pieces per year. Following thorough washing and nickel plating on some parts in the Schrader plating facility, the components are brought to the valve assembly area. During the assembly operation, which produces two valve cores a second, each valve is subjected to multiple quality checks for dimensions and assembly integrity. Every valve is leak tested ensuring when the (end user) technician pulls a valve out of the box he can be confident it will not need to be replaced again. Schrader produces these A/C valves for the OE vehicle market, but all valves including those for the aftermarket, are made to the same exacting standards. Jeff started his employment at Schrader in 1991. Jeff had assignments in manufacturing, engineering and quality, as well as product engineering. Jeff helped implement new valve designs supporting the transition from R-12 to R-134a. In addition to his responsibilities at Schrader, Jeff has been active with the SAE Committees responsible for drafting the Standards for A/C systems, helping to assure the valves function effectively in the system. Now, with the transition to R-1234yf, and development of possible R-152a and R-744 systems, A/C valves continue evolving to meet new system needs. Jeff splits his time between the production floor, the test lab and customer meetings. 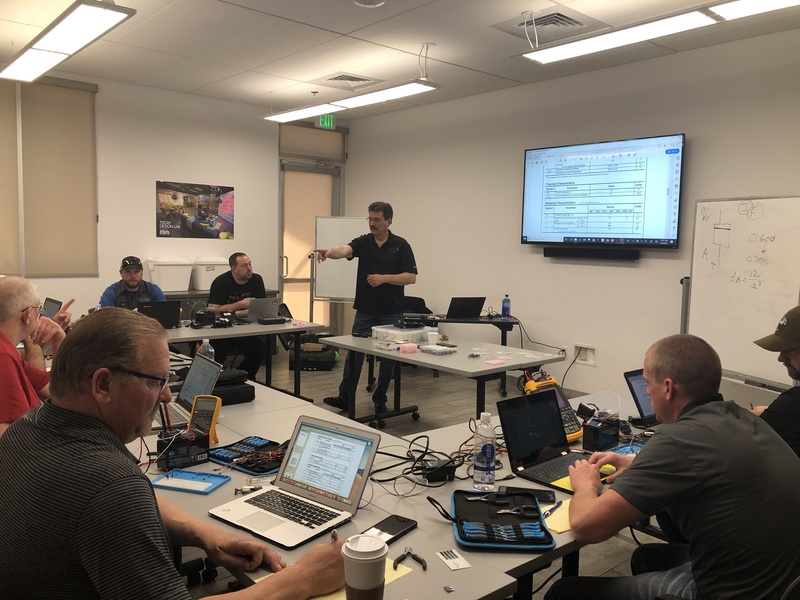 It’s not unusual to find Jeff collaborating with the vehicle engineering team, or the line suppliers, or at one of the vehicle assembly plants assisting with vehicle charging or other build concerns. The current transition to R-1234yf has brought a number of new requirements: higher operating temperatures, new refrigerant oils, and increased system integrity. While the changes to the valves aren’t obvious, there have been a number of new improvements implemented and countless laboratory hours spent in testing to assure that Schrader valves will meet every challenge. MACS’ importance gains increasingly as A/C systems continue to become more complex, and more differentiated among different refrigerants. As a member of MACS for over 25 years, Schrader has recognized the critical role MACS plays in bringing essential product and system information to the aftermarket service industry. Schrader recognizes that MACS is our best means of talking to the people who use our valves, and know the service issues. We learn from MACS service technicians, and, in turn, we try to provide educational materials through MACS to help educate the industry about the valves. 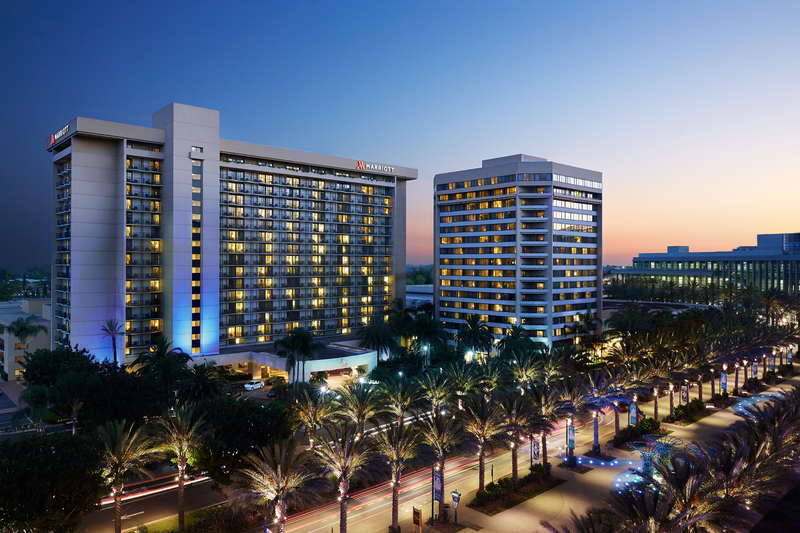 If you are coming to MACS 2019 Training Event and Trade Show, February 21-23, 2019 at the Anaheim Marriott in Anaheim, California, be sure to visit Jeff and his team in the Schrader booth.